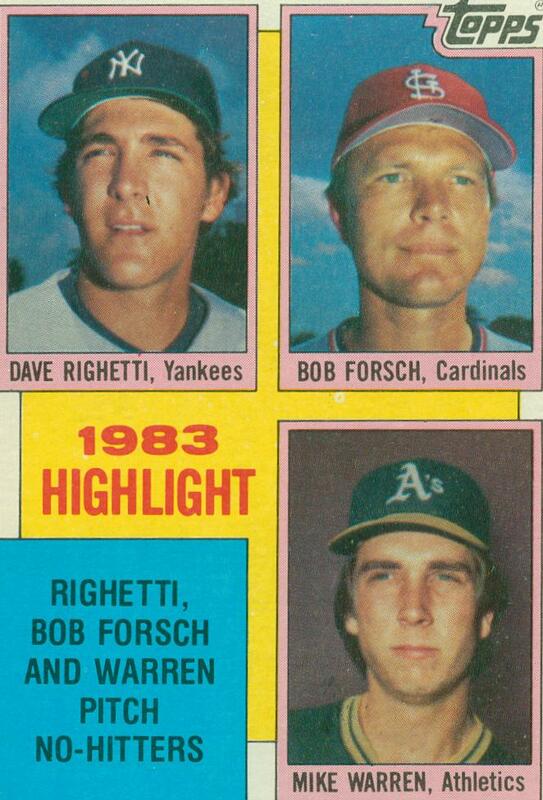 Text on the back – Bronx, New York, July 4, 1983: Yankees’ southpaw Dave Righetti today pitched a no-hitter vs. Red Sox. He’s 1st lefty to hurl gem in Yankee Stadium. St. Louis, Missouri, September 26, 1983: Cardinals’ right-hander Bob Forsch tonight pitched the second no-hitter of his career. He whitewashed Expos, 3-0. Oakland, California, September 29, 1983: A’s right-hander Mike Warren tonight pitched a no-hitter vs. White Sox. He’s 13th rookie ever to accomplish feat. 25 years later – 3 no-hitters in the same season – you don’t see that very often anymore.